If you have shopped around lately, you might have noticed cars, homes and credit cards cost more. The cost of any product or loan that has an interest rate attached has increased in a short period. After nearly a decade of low interest rates, the sudden spike leaves many wondering what happened. Understanding how interest rates work will answer common questions about the effects of rising and falling rates. The central bank of the U.S., the Federal Reserve, sets the "benchmark interest rate." This is the rate banks will pay to borrow money from the Fed. Raising the benchmark rate causes banks to borrow less from the Fed and charge consumers more interest to borrow from them. When rates increase, consumers spend and borrow less to adjust to the higher prices. Businesses raise their prices to make up for price increases on their goods and services. A credit card company that has to pay more interest will pass on higher rates to their cardholders. A farmer who has to pay more interest on equipment leases will charge stores more for produce. That means stores will charge customers more for fruits and vegetables. Why are interest rates rising now? According to the New York Times, the Fed raised interest rates twice this year. That makes nine times in the past three years. After lowering the rate in 2008 during the financial crisis, the Fed now thinks the economy is stable enough to handle an increase. The lower rates in previous years was an effort to encourage spending and boost the economy. Now interest rate increases are an attempt at a stable economy without help from the Fed. 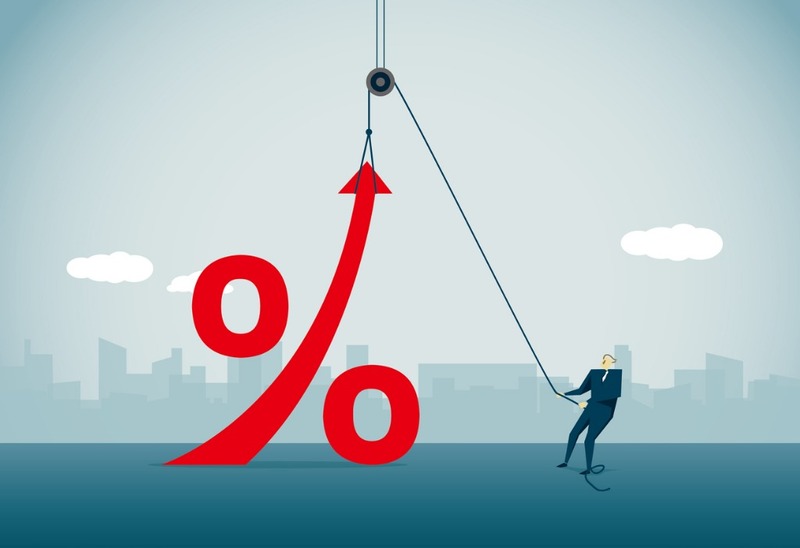 How do rising interest rates affect me? Higher interest rates can affect your lifestyle in several ways. Consumers tend to borrow less or pay more. Either way, it decreases how much goods they can buy. Borrowing money to buy a home or car, or using a credit card means paying more for the item over time. Higher interest rates mean restrictions on certain purchases, but also hopefully higher earnings. With rising interest rates, you can sometimes see higher wages and better returns on savings and investments. Wages have not changed much this time around, though, even with so many unfilled jobs. The difference you will see in savings interest rates depends on the type of account. Fed rate changes do not directly link to interest activity for savings accounts. Check your bank's website for increasing rates or call directly to see if they take fed fund rates into account. But some banks still consider it when making interest adjustments. Most traditional bank accounts have maintained low returns for some time. If you have a savings account at a regular bank, your average interest rate probably is less than 1 percent. That means your $5,000 in savings will earn less than $50 in one year. You will not see much difference in your earnings when interest rates increase. If you are looking for a higher return, learn more about investments and how interest rates affect them. Traditional banks adjust their annual percentage yield (APY) very little - if at all - in response to the Fed's rate hikes. Credit unions and online-only banks respond better to rising interest rates. If you use either, you can expect to see an increase in your APY whenever interest rates rise. Interest rates also affect supply and demand. When interest rates are low, demand is high, and consumers purchase more goods. When interest rates rise, demand falls, and consumers spend less. The same goes for investments. The price per share rises and falls as interest rates change. Those changes also affect how much you are willing to invest. When the price per share rises, the money you invest purchases a smaller portion of stock. Rather than dumping money into a savings account, it may be better to invest in banks during high-interest times. According to USA Today, investors will benefit from the return on the higher interest rates banks charge their loan customers. Investing in banks might be a better long-term move versus a shorter term investment in real estate or utilities for dividends. Homes cost more when interest rates rise. Higher mortgage loan rates and reduced purchasing power are the main reasons. When banks pay more to borrow money from the Fed, they will borrow less and charge more interest to their customers. Higher interest rates force some to buy a home quickly before rates increase further. Higher interest rates and increased home prices can also change the type of home you can afford. Your budget with a monthly mortgage of $1000 is a lot different with a 6 percent interest rate than with a 4 percent rate. If you still think the right time to buy a home is when rates have just increased, wait until there's no panic over rising prices. Selling prices on homes should level out as the crowd of potential buyers decreases. You also need to focus on making sure your credit score and debt-to-income ratio are solid. The Fed plans to make at least three more rate increases in 2019, so prepare now. Learn more about how rising interest rates affect your finances and planning. Make adjustments such as switching to a different savings account, changing investment activity and shopping around for the best mortgage deal.